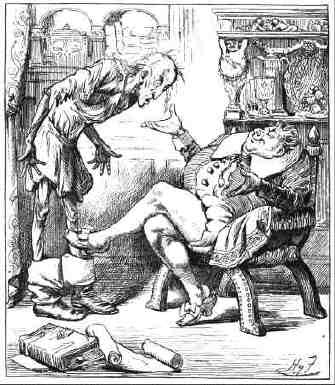 Turns out, Lewis Carroll is the best writer for the layman on taxes, too! When I first put this book on the web back in the nineties, I thought this an interesting nonsense poem. Looking at it again just after the government healthcare takeover, and it’s sounding a lot more realistic. We’re promised free healthcare, but the bill’s coming due first. And given the way government works in everything else, the chances of getting what we were promised is slim. Now I see in the Washington Post that the Obama administration plans on “requiring lenders to temporarily slash or eliminate monthly mortgage payments”. Banks are already doing this if they think it makes sense; banks don’t want to take a total loss when they could take a partial loss instead. If they can already do it, they already are. But forcing them to even when they can’t afford it? That’s a recipe for another crash. And, of course, to the extent that this is a program that’s being funded it’s being funded with either or both of the TARP funds or the bailout funds. Neither of those funds have been paid for yet. It’s coming from the Washington Post, so it could easily be wrong. But after the health care takeover, it isn’t hard to believe. The Obama administration doesn’t appear to have any concept of how economies work—that money has to come from somewhere. Just like forcing insurance companies to accept known liabilities will raise all of our insurance rates (or reduce all of our available health care) forcing banks to make financially deadly acts will make all of our finances less stable. We can’t force “the banking industry” to pay for anything. The banking industry is everyone who has money in a bank or whose employer has money in a bank. If the “banking industry” has to take a loss on home loans, then all of our money is at greater risk. All of our savings will be worth less when banks can’t pay as much on them—or when inflation causes our actual money to be worth less. All of us who need loans tomorrow will be less likely to receive them, because banks who are underwater in current loans can’t afford to give new ones. Our employers will find it harder to stay in business if loans they would otherwise have received are now denied because of forced loan forgiveness or forbearance. One of the many advantages of a federal system is that states do the work and the federal government prints the money. This means that for the states, money is real. To get more, they have to tax more or spend less. The problem, as we centralize all power at the federal level, is that to the federal government money is not real. They can tax more or print more; the fact that printing more makes all of our money worth less doesn’t matter to them. Taxes are always inefficient. Doesn’t mean that they’re not a necessary inefficiency at times, but they’re always filtered through government programs that have to first pay for government workers, government offices, and government paperwork before the money can go to what it’s ostensibly for. Take a look at the health care takeover. It’s going to require over ten billion dollars just for the IRS. They’ll need to hire 17,000 new IRS agents. That money will come out of what used to go to our health care. Sometimes we’re lucky if we get any of it back at all. ‘The First of April, as I think. Said Paul ‘I cannot change the date. ‘Well, well!’ said Peter, with a sigh. ‘Hand me the cash, and I will go. You won’t be richer when you’re bald! ‘Nay, nay, nay Peter!’ answered Paul. ‘You must not rail on Fortune so! ‘But pay your debts!’ cried honest Paul. ‘My gentle Peter, pay your debts! That you describe as your “assets”? It pinches me—but never mind! ‘How good! How great!’ poor Peter cried. Ah, Peter, you’re a happy man! The dinner-bell’s a sound of ruth! Said Paul, ‘in parting with one’s pelf. I’ve left my legal friend outside! On-line text for all of Lewis Carroll’s Alice books and his Sylvie & Bruno books, as well as more of his poetry and writings. The first half of the story, with illustrations. Robbing Peter to pay Peter… later last modified January 15th, 2012.